Study towards a TOEFL®, IELTS®, Cambridge, GRE® or GMAT® qualification with a specially designed course for each option. Some of our schools are also test centers, so you can study and take the test in the same place. Exam preparation courses with Kaplan International English are the quickest way to your certification. Prepare for your test with a world leader in exam preparation. Our Exam Preparation Courses: Cambridge CELTA: The Cambridge CELTA is a teacher training course that will put you on the path to being an English as a Foreign Language teacher, certified by Cambridge University. Take the CELTA and learn what you need to know to be an effective, successful English teacher and use your qualification to get a job! Cambridge Exam: The Cambridge Exam is an internationally recognized test and qualification of English language ability. Our Cambridge preparation courses enable you to feel confident taking the exam and help you gain the best mark you can. Cambridge FCE Exam Preparation: During lessons for this FCE preparation course, you will cover all sections of the FCE in detail. This includes taking practice tests, learning the best exam techniques, and improving your general level of English. Cambridge CAE Exam Preparation: During lessons for this CAE preparation course, you will cover all sections of the CAE in detail. This includes taking practice tests, learning the best exam techniques, and improving your general level of English. GMAT® Exam Preparation Course (USA MBA Preparation): GMAT® is a popular test that is required if you wish to study an MBA course in the USA, and is highly respected in the world of business. Our GMAT® Exam preparation course includes detailed lessons, practice tests and Kaplan’s exclusive test materials. Additional lessons focus on improving your English by using print and online exercises. We offer the Kaplan Higher Score Guarantee when taking a GMAT® preparation course. If you are not ready to take the exam, or not satisfied with your score, study for free for the next test date, as long as you meet the basic study requirements. This means attending all classes and structured study sessions, doing your homework and taking the practice exams. GRE® Exam Preparation Course:The GRE® is a user-friendly test that is required if you wish to study at a graduate school in the USA. Our GRE ® Exam Preparation Course will help you practice your English and learn test-taking skills using exclusive course materials. Learn about the structure of the GRE®, the types of questions and topics you’ll see, and improve your score on the test. We offer the Kaplan Higher Score Guarantee when taking a GRE ® preparation course. If you are not ready to take the exam or are not satisfied with your score, study for free for the next test date, as long as you meet the basic study requirements. This means attending all classes and structured study sessions, doing your homework and taking the practice exams. IELTS Exam Preparation - Intensive: IELTS is a highly respected test of English language skills for educational and professional purposes, particularly for students who wish to go to university in the UK, Ireland, Australia, New Zealand, and Canada. 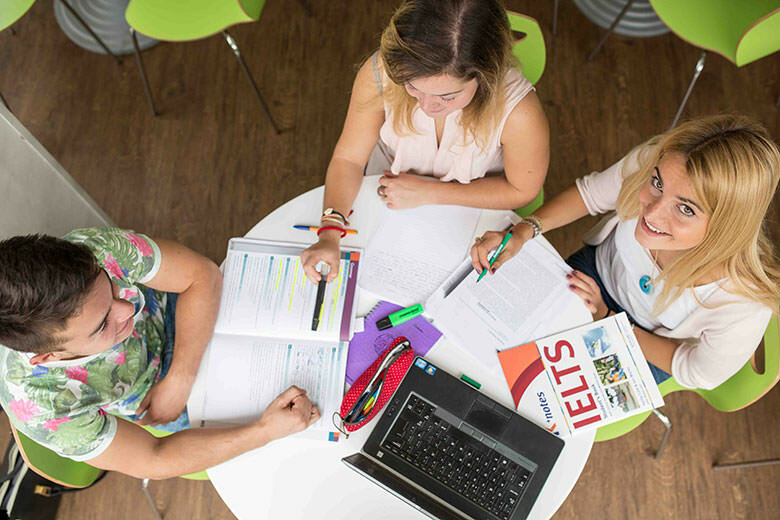 Our IELTS preparation course will teach you valuable English skills and strategies for taking the IELTS exam, helping you to achieve a better score. TOEFL® Exam Preparation: TOEFL® is the most popular examination for North American English and is the most widely accepted English language test in the world. Our TOEFL® and Academic English Exam Preparation course will give you the test skills and the level of English that you need to do well on your exam.